There are a lot of things in reselling that you can’t prevent, like returns, waning interest in a product, and general market changes. But there is one thing you can prevent, is having to return a product—or finding some other way to offload a product—because Amazon won’t let you sell it as new, or worse, won’t even let you send it into Amazon. One of the common things that Amazon will do for some products (I’m looking at Samsung Galaxy Tablets here), is to restrict sellers from selling as new. There are ways around this, but the fact remains, when you have to sell a product as “Like New” you can’t price it higher than a product that is listed as “New.” You can try. You could even try putting comments in the condition description, but if you go too far, Amazon will catch you. 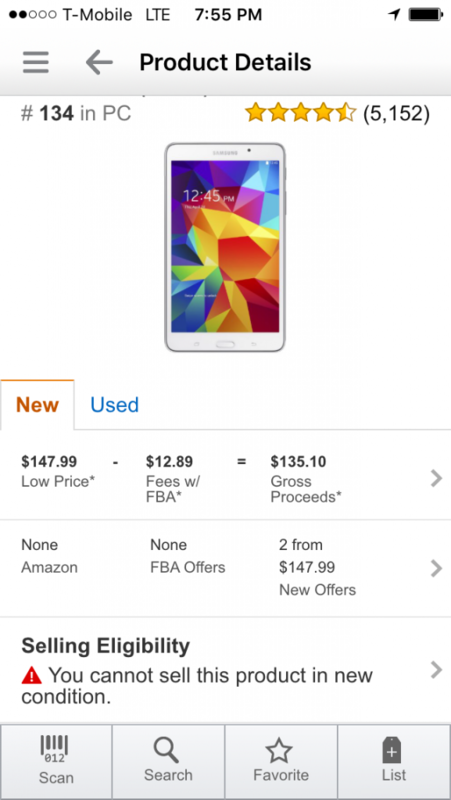 Samsung Galaxy Tab’s can’t be sold as new. For my estimation purposes, I will discount the buy box price for new by as much as 20%. Meaning, if I can’t make my desired margin, selling at 20% lower than the buy box, I won’t go buy the product. I don’t sell a lot of “Like New” stuff as a result. I first encountered this pretty early on in reselling, when I got an excellent deal on a Soda Stream machine. It was all the rage at the time. You could make your own soda, flavor it how you like it, and do it in the convenience of your own home! What more could you ask? Well, I think the component of the machine that gives you the fizzy bubbles, makes this product a Hazardous Material in Amazon’s eyes. They don’t want that thing anywhere near their warehouse, unless they purchased it themselves. For me, that was a frustrating day, when I had to take 10 of those units back to Kohls and explain, that despite the popularity, my huge extended family, had no desire for the product, and alas, my attempt at being a super generous son/brother/uncle/cousin was thwarted. Another shipping restriction we’re seeing more and more, is that Amazon is restricting some products from being sent into FBA because, apparently, Amazon Fulfillment Centers (aka Warehouses) are too full! Online Selling Experiment has a good post on how you can check whether Amazon will let you send your products in, before, hopefully you buy. This was a new one for me, one which I encountered a week or two ago, when I sent in a very promising test product of barbecue sauce. I was very disheartened when I saw 6 of those products immediately tagged as “Distributor Damaged.” Like anyone, who takes pride in packing as much into a box as possible, I knew that these bottles of BBQ sauce were in pristine condition and shipped well packed, they could not have been Distributor Damaged. So I put in a ticket, only to find out that Amazon doesn’t want things in glass bottles over 4 ounces that could fall from 6 feet, and make a big mess in their warehouse. Humorously, I paid Amazon to do the prep for the BBQ sauce, yet I guess they don’t even have the powers to properly protect a 6 ounce bottle of barbequey goodness. I wrote about Meltable Inventory last week – Amazon restricts any products that cannot withstand 100 degree temperatures from being shipped to, or stored in, Amazon warehouses, from 1 May to 30 September. That means, that great s’mores set that you can make a ton of money on for those sitting around campfires, is not going to be Fulfilled by Amazon during the summer. The message is clear. Add a product to your inventory–whenever possible–before buying. It takes only a few seconds, and it makes it a lot easier when you start putting together shipping plans. It can also prevent you from having to do a bunch of returns, or otherwise dispose of products that you cannot send into Amazon. Have you ever purchased a product that you couldn’t have Fulfilled by Amazon? What did you do? I know I’ve posted before to both you and Noah that I fulfill many of my Amazon orders. It isn’t for everybody. I have a few items that I would love to FBA, but Amazon won’t. One is a hazmat item like the CO2 canisters you tried (those can’t be shipped by air or through any tunnels). It is very profitable but shipping varies widely. Some grocery items don’t have a long enough expiration to ship and sit in Amazon warehouses, so those have to be merchant fulfilled. I have had Amazon mark incoming FBA stock as damaged, removed it to fing nothing wrong. One item is a DVD that comes from the factory in a paper sleeve. I think Amazon believes it should be in a jewel case? I just ship those myself, which is more profitable anyway and the only other seller is MF. If I can’t FBA, MF or Ebay, if that won’t work…take it back. @Dave – I do recall you mentioning that you do a lot of MF. I certainly don’t feel like I have that kind’ve time, but I’m glad that it works for you. You’re right, FBA has some detractors, but, it is a big time saver. I’d imagine a prep/pack/ship type place might also be able to do MF, although not sure if it is in their business model, or if many can be that quick. I did not realize that Amazon puts things into Gaylords for sale… It makes sense, probably easier to get rid of that way. @Talljames – Yeah, I hate it when that happens! I have done that myself, too! 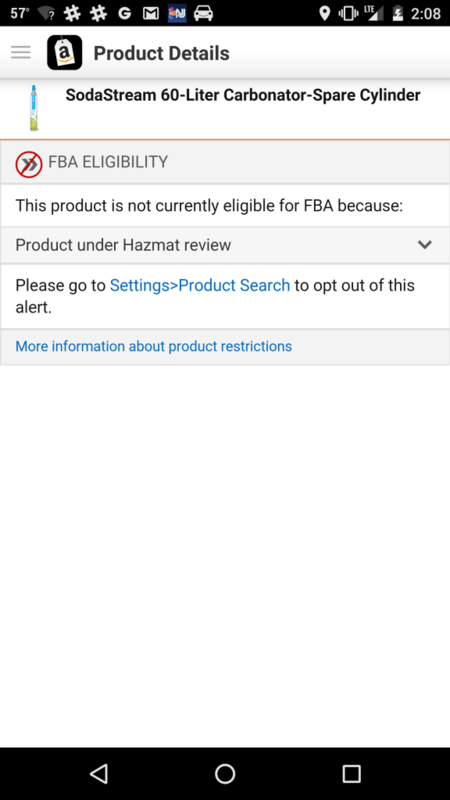 “Hazmat” lotion and body spray. Seriously, mainstream stuff, not an unusual brand or anything. I was able to add to inventory and all that, but then the items would disappear from the shipping plan. I haven’t decided what to do with it all yet, and now I’m living in Europe for 7 weeks. Still reselling though – and using what I call “Fulfillment by Momazon” to send in shipments.